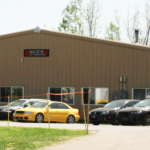 Steelsmith designed and delivered a 6,000 sq ft metal building for Nate’s Automotive in 2016. We are now working on a second steel building for Nate’s Automotive. The building currently in progress is going to be 1,000 square feet and will be utilized as a state-of-the-art repair facility and their sales space for high-end, performance based mods, Superchargers, turbos, etc. We look forward to sharing more about this project as it progresses.